Mercer began his collegiate career at Orange Coast College, where he played both football and volleyball. He was selected first-team all-state as a sophomore and was chosen as one of the country's Top 100 JUCO's. He graduated from the University of Miami, where he played football. After getting his degree in Marketing and Finance, Mercer played for the Washington Redskins and the Berlin Thunder (NFL Europe). In high school Mercer played four positions in football in addition to lettering in basketball and track. He was first-team all-conference in basketball as a senior, and was the conference high jump and 100-hurdles champion as both a sophomore and a junior. One of eight children in his family, Mercer was an honor roll student throughout high school. 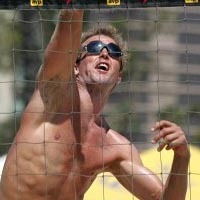 He won third place in the 1993 Junior Olympic Games in beach volleyball.